Small pieces of plastic, many invisible to the naked eye, are showing up in New Brunswick's freshwater systems, researchers say. A Mount Allison research team studying the presence of microplastics isn't sure what effect the material will have on aquaculture and humans until more research is done. Microplastics are small particles of plastic less than five millimetres in size that come from synthetic clothing, beauty products and essentially anything made of plastic. 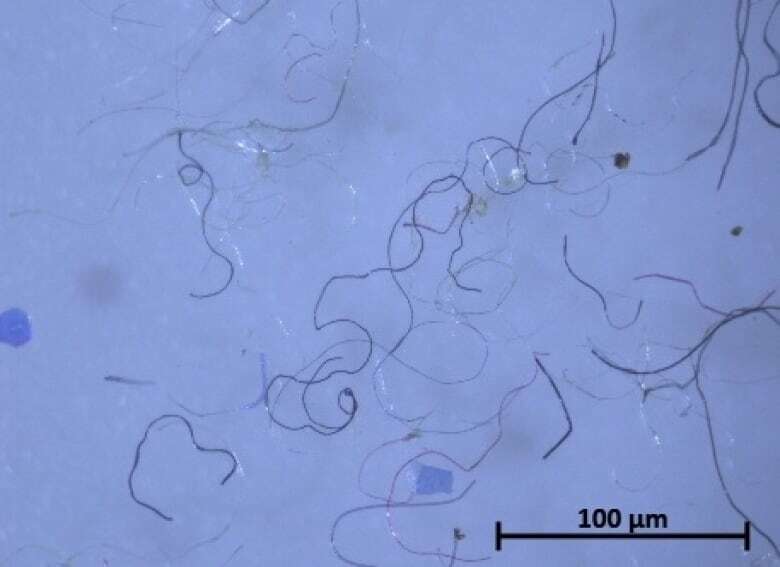 "They can be long stringy fibre bits, they can be small angular plastics, or they can be small micro beads," said Joshua Kurek, assistant professor of geography and environment at Mount Allison University. Kurek and honours student Taylor Crosby spent the summer collecting water and sediment samples from 10 different sites across the province both downstream and upstream from sewage treatment plants. To their knowledge, it's the first time testing is being done for microplastics on freshwater in the province. "At a number of sites we found anywhere from dozens to hundreds of microplastics, the majority of those being small fibres a fraction of a millimetre in length," said Kurek. The researchers tested sites in Richibucto, Rexton, Miramichi, Sackville, Petitocodiac, Sussex, Rothesay/Quispamsis, Oromocto, Fredericton and Woodstock. In keeping with similar work done in other provinces — for example, around the Great Lakes — Kurek said samples are taken near sewage treatment areas because they are thought to be a main source of microplastics. "I think that most of the clothing that people are washing are made of synthetic materials like plastics, and when you dry your clothing in your dryer you often scoop out the lint trap," he said. But washing machines don't have similar filters, he added. "And because the microplastics are so small, they're not screened by the sewage treatment facilities as they discharge the effluent into either holding ponds or freshwater environments." Crosby said the field work was done using a boat trailing a net that filters water, catching the microplastics in a small sock at the end of a plastic funnel. In smaller streams, she scooped water using a bucket. But the testing was a leap of faith until the samples were brought back to the lab. "You don't see until you've processed it and put it under the microscope. Before I looked at my first sample, it was kind of like, 'Well, here's hoping,'" said Crosby. While the data is still preliminary, Crosby said every sample showed at least some microplastics, and there is a trend. "For example, in Oromocto I found tonnes more microplastics downstream than upstream, but I'm still finding them upstream as well." Crosby said studied other microplastics research before doing her field work and learned that microplastics are being found in the air and in drinking water. "There are studies that have found them in deep sea environments, to like arctic ice to places where there just are not people." Finding microplastics in New Brunswick rivers and streams wasn't a surprise, she said, but it was eye-opening. "You realize just how much plastic has worked its way into society." When asked about microplastics, the province responded: "The Department of Environment and Local Government is aware of this issue and is satisfied with the action taken to date by Environment and Climate Change Canada," referring to the federal ban of microbeads. Microbeads are tiny plastic balls often found in cleansers and body scrubs are so small fish can confuse them for food and die of starvation. Manufacturing products with microbeads will be banned in Canada starting next year. Selling such products was to be banned July 1 and microbeads will be added to Canada's list of toxic substances. But Crosby said she hasn't found any microbeads in her sampling so far. Researchers at the University of Toronto have found microplastics in mollusks like oysters both in field research and in retail outlets. Kurek said scientists are looking at toxicology studies to better understand the effects of microplastics. "With plastics everywhere, it's going to be in our environment, if its at high enough amounts or concentrations it may pose a risk to organisms including humans." The study is expected to be finished in April 2018, when Crosby said she'll finish processing the data and hand in her thesis. Concern about microplastics in North America’s Great Lakes.